We could fulfill the quality certification following the actual version 2015 in the latest audit in February 2018. ZDH-Zert has again confirmed our very high quality standard for all our products. The actual certificate can be downloaded from this website. A new sales partner for all Schmierer-Products has started its activities on 1st of July 2016. WEEECO – West Energy Equipment Engineering Co. is a new sales partner on non-exclusive basis, located in Erbil. Address and contact details can be found under “Sales Organisation”. We are looking forward to extending our market activities in Iraq. High quality pressure and temperature gauges made in germany: bourdon tube, diaphragm, capsule, test and differential gauges. Bimetallic, gas filled and machinery thermometers. PDF ready to download. Differential pressure gauges types DGU 100 and DGU 160 can also be supplied for the pressure ranges 0-25 mbar and 0-40 mbar; the lowest range in combination with inductive contact switches will remain with 0-60 mbar. 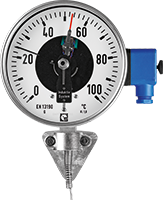 All our pressure gauges are certified according to ATEX rules. The actual declarations of conformity can be downloaded. Our company has been certified according to ISO 9001 since 1995. The actual certificate can be downloaded. Our production will be checked with monitoring of the final assessment (Module A 1) according to directive 97/23/EC. The actual certificate can be downloaded.